These blogs are a series of letters that I have been including in our weekly bulletins to the congregation in hopes that they may stimulate more deeper conversations about scripture, allow us to wrestle together with our understanding of it, and explore how we can begin to move forward in living out our faith as disciples of Christ in a world that is hurting and broken. These letters are presented in reverse chronological order, so the most recent ones will appear at the top. You can read them alone as stand alone letters, or scroll to the bottom and read them in order working your way up. I hope you find them challenging, edifying and spirit-breathed as they were intended. Let’s begin with this fact: given my place of relative comfort, I don’t think I even know all the people who are oppressed and all the ways these people are oppressed. From this humble place of acknowledgement, I can try to speak about oppression. First, a two page letter CANNOT cover everyone who is oppressed and every way they are oppressed. Second, I don’t want to speak to individual oppressors or individuals who are oppressed. These relationships must be addressed, but we must begin by addressing structures and systems that oppress people groups. If we can dismantle these systems, broken individual relationships have the foundations of oppression destroyed. And we begin with a simple question, “Who are the oppressed” from a systemic or structural framework? I will address three people groups. First, women have been oppressed in systemic ways from the loss of our garden innocence. Genesis 3 tells us that evil brings forth the system of patriarchy, “Your desire shall be for your husband, and he shall rule over you.” We find this rule in the description of women as property, in their inability to own land or live in autonomy for the direction of their lives or their bodies. These dynamics continue into our present time. Women in churches are often taught that they must “submit to their husband, as their head,” a denial of autonomy for their lives and bodies. I grew up hearing pithy phrases like, ‘You throw like a girl. You run like a girl. A woman’s place is in the kitchen,” a defining dynamic that women are less, ideas that barely raise a woman’s worth above property. It is better today, for sure, but there is more work to do to dismantle the system. Second, black and brown folk have been oppressed in systemic ways almost as long. We can stick to our own country and its original sin of slavery, but that system of thinking less of someone for the color of their skin has never fully left us. Slavery turned to lynching and various laws meant to disenfranchise and disempower. Lynching gave way to Jim Crow (even as it continued). Jim Crow gave way to the War on Drugs and mass incarceration. Through these systems we discover redlining, prejudice in application of Social Security benefits, the GI bill, loans, job advancement, military advancement, segregation that still exists today through various ways and means. It is better today, for sure, but there is more work to do to dismantle the system. Third, LGBTQ+ folk have been oppressed in systemic ways just as long. Their love has been declared illegal. They have been jailed and killed, ridiculed and isolated. There is a reason that for most of history, “being in the closet” was the defining reality of most LGBTQ+ people. It was the only safe way to exist. This dynamic makes me think of Psalm 32:3, “While I kept silence, my body wasted away.” If Keller is right in his quote above, the oppression for so many LGBTQ+ people is they have been loved, as long as they remain unknown, which is superficial, or they have lived in the very realistic fear that if they were to be known, they would not be loved, and so they wasted away in silence, suffering under the weight of system that oppressed for simply existing. It is better today, for sure, but there is more work to do to dismantle the system. These are the oppressed that come to mind for me. So what might freedom mean for these groups? What system could we try to build up that seeks the freedom of those who have suffered? I think our fear in even entertaining a new system is the belief that the only way to view the world is through a win-loss binary, through a worldview of scarcity. It is simple to explain. The pie is only so big. If someone else gets more of it, I must receive less. If someone else wins, then I must necessarily lose. If I make room for women, black and brown folk, and LGBTQ+ people at the table, then I will lose my seat. This is the sort of thinking that makes equality feel like oppression. But, Keller’s quote offers us a different vision for how we might see the world. To be fully known and truly loved is the radical welcome of God, and there is no limit on it. It expands the pie, finds winning in the very center of loss (think the cross), and expands the table until all have a seat. It is hard for us to imagine this could be possible in our world, but if the gospel makes no difference in our lives, what is it worth? If God has nothing to say about the organization of the here and now, how is God sovereign and good? Could it be true that at the deepest essence of creation, there is an expanding and growing dynamic that offers more than enough for everyone? This is the earliest vision of the followers of Christ. “All who believed were together and had all things in common; they would sell their possessions and goods and distribute the proceeds to all, as any had need” (Acts 2:44-45). What if this vision of plenty is the living out of the radical welcome and love of the body of Christ, and here is where the oppressed go free, here is where everyone is fully known and truly loved? It starts us thinking that maybe the church is meant to address these kinds of problems in our communities by the very nature of who we are. Maybe the first step is to listen to the oppressed, to let them tell their stories, because these stories matter, to see them as fully human, and acknowledge their experience. Then we might bear witness to the kingdom of God by naming the systems and structures that oppress, acknowledge they exist, and work in the love of Christ to undo them. Let me see a church like this—that sees, speaks up for, and stands with the hurting, and I will celebrate an ambassador of Christ, a community that lives a cross-centered life, and who bears witness to a whole new way to live … reconciliation for all, which makes all things new (2 Corinthians 5:16-21). I cannot tell you how much I appreciate Kate’s insight into the name El Roi given to God and in my mind the ways it unlocks the deep theme of recovery of sight to the blind from Jesus’ vision and energy for ministry. What if recovery of sight to the blind is captured by Mary Oliver’s keen insight, “Attention without feeling, I began to learn, is only a report. An openness — an empathy — was necessary if the attention was to matter.”? In seeing the other with empathy, openness (as God sees), we recognize their humanity, their deep and unmatched worth in the eyes of God, and we cannot help but see the Kingdom of God all around us. Jesus says that once you’ve seen, you cannot un-see. I think Jesus is speaking of seeing with the eyes of the other, the eyes of the unseen and through their eyes, learning to see with the eyes of God. “May we, in love and obedience, open our eyes” to see, to recover the sight of God, and may we, in faithfulness, share, teach, and lead in the recovery of sight to those who cannot or will not see the unseen. As much as we like to spiritualize the Gospel, I don’t think we can talk about this direction or action in Jesus’ ministry without talking about Mass Incarceration. In 2018, 2.3 million people were held in jail or prisons throughout our country, more than any other country in the history of the world. The U.S. represents about 5% of the world population, but we house around 25% of the world’s prisoners. Are we that much more violent than the rest of the world? The FBI reports that over the last 25 years, the violent crime rate has fell 49%, but since 1980 incarceration rates have increased over 500%. What is happening in the U.S. that causes us to imprison so many of our people? If these statistics aren’t shocking enough for us, an additional 840,000 people are on parole and 3.7 million people are on probation, which means almost 7 million people are under the control of the justice system. One last piece of the puzzle is important for us to consider. The likelihood of imprisonment for U.S. residents born in 2001 is 1 in 17 for White men, 1 in 6 for Latino men, and 1 in 3 for Black men. The statistics are just as racially biased for women: 1 in 111 White women, 1 in 45 Latino women, and 1 in 18 Black women face a likelihood of imprisonment. People of color make up 37% of the U.S. population but 67% of the prison population. What would it mean “to proclaim release to the captives” in our society? What could it look like to live Christ’s ministry today? Our introduction to this topic with the idea of proclaiming release to the captives may be overwhelming. When you look at these statistics a myriad of emotions can rise to the surface. We may think, “If you do the crime, you must do the time.” Of course, this misses the fact that on any average day in America, 487,000 people are in jail waiting for trial in most cases because they cannot make bail. If you lack the resources to make bail, you clearly can’t afford to miss work. A significant number of people facing these circumstances plead guilty to a lesser charge (whether they are innocent or not), so that they can move on with life without losing their job. Unfortunately, they now are on probation under the control of the criminal justice system, losing much more than they bargained for with a simple plea deal (including public housing assistance, food stamps, loss of voting rights, the right to serve on a jury, and job discrimination in a variety of ways). We may think, justice is blind, just don’t get in trouble and you’ll be fine. Of course, this ignores the statistics we mentioned above about racial bias. It also ignores the slow erosion of any acknowledgement of racial bias within the justice system. Consistently for the last 60 years the Supreme Court has ruled in favor of police tactics that slowly erode the rights of citizens. If applied equally, this would be a tragedy, but since police “stop and frisk” black and brown people at much higher rates, because poor neighborhoods are more heavily policed, this erosion of rights is a travesty of blind justice placed on poor black and brown folks. 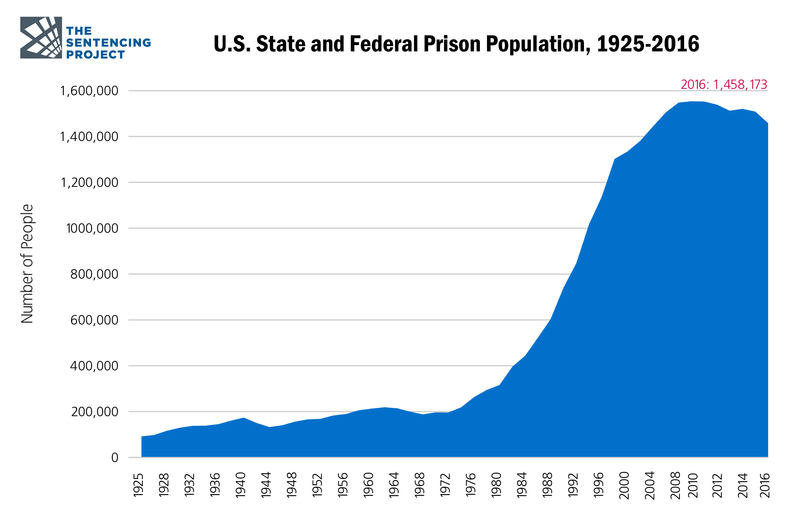 If we look at the chart presented here, we see the growth of the prison population started in 1980. It is not a coincidence that this coincides with the “War on drugs” movement of Ronald Regan and exacerbated by the “Three strikes” program of Bill Clinton. A few simple statistics make the point. “Approximately a half-million people are in prison or jail for a drug offense today, compared to an estimated 41,100 in 1980 …. Drug arrests have tripled since 1980 …. To put the matter in perspective, consider this: there are more people in prisons and jails today just for drug offenses than were incarcerated for all reasons in 1980.” Lest we think this represents a crackdown on sellers, 4 out of 5 drug arrests are for possession. Lest we think this represents a crackdown on “hard” drugs, 80% of these arrests are for marijuana, and most people in state prisons for drug offenses have no history of violence or selling drugs. In a 2004 study called, “Rate of False Conviction of Criminal Defendants Who Are Sentenced to Death,” they found that from 1973-2004 117 people (1.6%) were exonerated, but an additional 200 people (about 4%) would have been exonerated if given the time and resources to fight through the appeal process—about 200 people were put to death who were innocent. It will be no surprise given the statistics quoted above that the majority of inmates on death row are black or brown. In addition, a significant number of death row inmates suffer from some form of disability, which was never acknowledged or given proper weight or care either when the case was tried or when the sentence was given. With all of these issues and statistics, I would recommend two great books to develop your understanding of our current justice system: Just Mercy by: Bryan Stevenson, and The New Jim Crow by: Michelle Alexander. What does “proclaiming release to the captives” look like in our current situation? First, I think we need to have honest and direct conversations about issues of race and racial bias in our society. Can we honestly say that if 1 in 3 White men were spending significant time in prison (most of them for minor drug offenses), we wouldn’t change the system? Second, we need to reframe our ideas of justice through the lens of grace and mercy, especially for minor offenses. Third, we need to end the War on drugs. It has failed. Fourth, we need to reform the entire criminal justice system. It has failed. I do not have all the answers, but if the energy and direction of Jesus’ ministry drives us, this is what “proclaiming release to the captives” looks like. The Thesis of Jesus’ Ministry (Part 2): Bringing Good News to the Poor. What does that really mean? In my previous blog, I started a working letter study of Jesus’ Thesis for ministry taken from Luke 4:18-19, “The Spirit of the Lord is upon me, because he has anointed me to bring good news to the poor. He has sent me to proclaim release to the captives and recovery of sight to the blind, to let the oppressed go free, to proclaim the year of the Lord’s favor.” We began by looking at what it might mean for the Spirit of the Lord to come upon Jesus and then what it might mean for the Spirit to come upon us. This week we are starting to look at the five actions that Jesus names for the energy or direction of his ministry. The first action is simple, “to bring good news to the poor,” but what does that mean? In thinking about what this “good news” might be, I decided to work with an interview of Robert Sapolsky, who wrote the book, Why Zebras Don’t Get Ulcers. It is a book about stress and its effects on primates (including human beings). In the end of the book, he applies the lessons he’s studied about chronic stress and its effects on people who live in poverty. These ideas intrigued me and made me think about how we might interpret what “good news” would even look like for the poor. I’ll share a summary of Sapolsky’s work and see if we can apply the insights into our message of “good news” in following Jesus. One of the first thing Sapolsky notes in the data is that poverty has a direct relation to health. In every area, in every form of poverty, we find clear connection to worsening health outcomes for people. Sapolsky summarizes with these words, “Poverty is the psychological sledge hammer like nothing that the primate world has ever invented.” In deeper studies about the effects of poverty, there are a number of variables that show significant impacts on human health. First, the objective fact of your poverty (low income, low status) is no better predictor of health than your subjective feeling of poverty. In other words, it’s not being poor, it’s feeling poor that matters for your health. Second, there is another key ingredient. In addition to feeling poor, you must also be surrounded by plenty. Rampant inequality predicts poor health outcomes, and interestingly, not just for those who are poor but for everyone. Those in poverty are affected most, but everyone in a society of economic inequality suffers with worse health outcomes. The second thing Sapolsky notes is when people feel stress we have worse health outcomes and feel worse, if we feel like we have no control. With this in mind, we all develop a working strategy of telling ourselves that we have control. This works well with mild stress events. We tell ourselves we have control, and therefore it could have been much worse, but in high stress events or chronic stress, this story of control makes us focus on how much better it could have been if we had made better choices. When we apply this to poverty and we tell the story that anyone can pull themselves up “by their bootstraps,” or poverty is a moral failure of bad decisions that you control, then poverty becomes an incredibly corrosive stress. It grows worse than the simple lesson that poverty causes stress, which leads to bad health. We could guess that is true, but what is also true is that stress can lead to poverty. In fact, it is a loop of human destruction where each amplifies the other with effects on the brain and body. For example, stress affects the pre-frontal cortex, the area of the brain which makes us do the harder thing when it is the better thing for us to do, i.e. long term planning, gratification delay, impulse control. Stress impairs the function of your pre-frontal cortex. Stress makes us more focused on the present. It makes us more willing to borrow in the present against the future. People become greater risk takers. In fact, chronic stress causes atrophy in the pre-frontal cortex. This means that long term stress makes it extraordinarily difficult to do the right thing when it is the harder thing to do. In studies, 5 year olds, who live in poverty experience higher levels of stress hormones, which causes atrophy in their pre-frontal cortex. At age 5, when you have no control over your life or what family you’ve been born into, your trajectory of getting out of poverty (because your pre-frontal cortex doesn’t function in an effective way to help you out of poverty) is severely limited. It hurts your ability to succeed in school (hurting memory, executive function of the brain, and impulse control), and increases your anxiety and fear. Every domain of life is affected by the loop of stress and poverty. It’s not impossible to escape, but it is magnitudes more difficult than the 5 year old born into a family of means. There is so much more in the research, but this should be enough for us to begin to think what it would mean to “bring good news to the poor.” These studies suggest that free will is something of a myth (not a shock for Christians), so what should we do? Maybe the best use of free will is to think of ourselves as having it, and thus responsible for our behavior, but acknowledge that others don’t have it (especially those in poverty and those born into poverty), which cultivates understanding, compassion, and forgiveness. The first step for bringing good news is compassion and understanding rather than judgment. With this compassion and understanding, the next step in bringing good news is not to make it harder to access help but to make it easier to get help. We don’t judge people as unworthy of our service because they are poor, we serve without judgment. Because we are limited in our ability to help people in poverty, we advocate as people of faith that every agency, in government and out of it, respond with the same understanding and compassion rather than judgment. Last week I finished my letter campaign on the Bible. I hope it was insightful and opened up a deeper relationship for you with the Word. When thinking about what to tackle next, if I was going to continue this “ministry,” I wanted to turn to what I sometimes call the Thesis of Jesus’ ministry. As this Thesis comes from the Gospel of Luke, it is more accurate to say it is Luke’s Thesis for Jesus’ ministry, but I think it does a good job of representing Jesus’ teaching ministry in the three Synoptic Gospels (Matthew, Mark, and Luke). Here are the verses that will be my focus for the next few writings: “The Spirit of the Lord is upon me, because he has anointed me to bring good news to the poor. He has sent me to proclaim release to the captives and recovery of sight to the blind, to let the oppressed go free, to proclaim the year of the Lord’s favor” (Luke 4:18-19). There are five actions that Jesus names for the energy or direction of his ministry. The first four are spokes on a wheel. The last action represents the center of the wheel. It is the foundation upon which all the other actions are built. We will study together those four actions and the foundation of Jubilee, but today we start with the power for these actions: the Spirit of the Lord. Luke tells us that Jesus unrolled the scroll of Isaiah and began to read from chapter 61. Chapters and verses did not exist at the time, so it is likely that the text for that day was marked for him, as they were reading their way through the prophet Isaiah. As Jesus reads, we discover the driving force behind everything he does. The Spirit of the Lord settles upon Jesus. The Spirit of the Lord drives and directs Jesus. The Spirit of the Lord is the energy behind the life and mission of Jesus. We see the truth of these ideas when we read Luke closely. The messenger to Mary offers this description of the work of the Spirit, “The Holy Spirit will come upon you, and the power of the Most High will overshadow you; therefore the child to be born will be holy; he will be called Son of God” (Luke 1:35). When Jesus was baptized, Luke tells us, “When Jesus also had been baptized and was praying, the heaven was opened, and the Holy Spirit descended upon him in bodily form like a dove” (Luke 3:21-22). And then in Luke 4, we find these two verses, “Jesus, full of the Holy Spirit, returned from the Jordan and was led by the Spirit in the wilderness” (vs. 1). “Then Jesus, filled with the power of the Spirit, returned to Galilee, and a report about him spread through all the surrounding country” (vs. 14). I could continue, but I think this is enough to prove the point. Jesus is energized and directed by the Spirit of God. When we think about the Spirit of the Lord, there is much that we can write. Books and books are written to describe the Spirit of the Lord, so I won’t cover everything, but as an introduction, I thought I would bring us to the very beginning. In the first creation myth of Genesis, a poem about God and creation, we find this beginning, “In the beginning when God created the heavens and the earth, the earth was a formless void and darkness covered the face of the deep, while a wind from God swept over the face of the waters” (Gen. 1:1-2). The Hebrew word for wind in verse 2 is ruach, which can also be translated, “Spirit.” “The Spirit of God swept over the face of the waters.” One interesting way to think about this introduction is the Spirit is the animating force behind the act of creation. One other way of thinking about this introduction is the Spirit is the reality into which all of creation is made. With these ideas in mind, we could say that everything created is incarnated into the Spirit of God, and the power of this incarnation is the Spirit. John offers us a similar vision seen through the Word of God, showing us the first incarnation of the Word is in creation. The Cosmic Christ (the Word) imbues everything in the first incarnation, and the second incarnation of the Word is in Jesus. Some of this may feel esoteric, but I promise it has a beautiful and powerful pay off. If the Spirit of God is something like the womb from in which all of creation is formed and that womb is the power to animate the cosmos, then the Spirit of God is in all things and through all things. In one sense, the Spirit of the Lord being upon Jesus is not unique to him, for the Spirit of the Lord is upon everything and everyone, energizing and giving life to everything and everyone. Jesus, as the incarnate Word of God, is not given special access to the Spirit of God, rather, Jesus reveals the deep truth that we all have access to this Spirit, and he does so through his deep understanding of the Spirit’s presence and his reliance upon the Spirit’s power and guidance. He shows us what it means to open our hearts and minds to the Spirit of God, who is in us, through us, and always around us in prayer, story-telling, and living his life before us. Jesus is empowered for this very ministry and revelation because of the Spirit, for the Spirit anoints Jesus. Anointing was reserved in scripture for Kings and Prophets, and Jesus serves as both in the Gospels. He brings forth the reign of God into the world through the power and presence of the Spirit that was always with creation, and he tells forth the Word of God (prophecy) in that same power of the Spirit. Jesus is the anointed one, the Messiah, who reveals these deep truths of God infused into the fabric of everything and everyone. The profound Good News of this form and power of Spirit in creation is that Jesus reveals what is available to all of us. The Spirit of the Lord is present, powerful, and a guide for all who seek the advocate that God is for us. It is true that Jesus is unique in that he is anointed as Messiah, as the One who reveals God’s will and way, but he is not unique in having the Spirit of the Lord come upon him. This is available to us all; therefore, the work of the Spirit, the energy and ministry of the Spirit is ours, just as it was for Jesus. We see this in John 16:13, “When the Spirit of truth comes, he will guide you into all the truth.” We see this in Acts 1:8, “But you will receive power when the Holy Spirit has come upon you.” We see this in Acts 2:4, “All of them were filled with the Holy Spirit and began to speak in the other languages, as the Spirit gave them ability.” Jesus reveals that we too have the Spirit of the Lord come upon us, and we too can follow Jesus in proclaiming good news to the poor, release to the captives, freedom for the oppressed and bring sight to those who are blind. The good news of Jesus as the revealer of what is true for us and not unique to him is we have the energy and power of the Spirit. May you live in that Spirit. May you follow Jesus, knowing that you too can do great things for the Kingdom of God. When I first began my preaching ministry, I was taught a simple acronym—PROBE. Each letter represents a skill set, but for our purposes, I want to focus on, P—which stands for Pray. As I’ve worked my way into a deeper understanding of scripture and prayer, my practice of prayer and its work in my preaching ministry has changed. I think this practice can also help you use scripture for good purposes and emulate Jesus and his practice with the Word. The first step with any prayer seeks guidance from the Holy Spirit as you open the Word. If we desire the Spirit to work in your hearts and minds through the Word, we must approach it with humility. For me, this means that I must sit in prayer until my heart and mind are fully open, until my attitude is one of a beginner or early learner with the Word. If I can open my heart and mind to set aside my pre-conceived ideas or interpretation, then I approach scripture with fresh eyes. I seek to see with the Spirit as the Word is opened up. The next step in prayer is almost a half-step from this initial move into humility, but it is essential. You need to detach yourself from your own ego, from your own will, goals, or desires. For me this means I need to set aside my yearning to be correct, secure, or in control. This is my deepest struggle. I love to be right, and I need to be in control. But how can I seek the guidance of the Holy Spirit, if I’m only willing to do it on my terms. The perfect example of this, “I’ll do it on my own terms” attitude is exhibited in Peter when he sees Jesus walking on the water, and he says, “Lord, if it is you, command me to come to you on the water” (Matthew 14:28). Peter is willing to come, but only on his terms, “if it is you …” When Peter gets out on the water he discovers just how futile his approach to Jesus on his terms will be, as in fear he began to seek. We need to relinquish control and enter into the freedom of the Holy Spirit bringing her terms to our interpretation, only then will we be free from making the text say what we need and want it to say. The next step in your prayer is what Richard Rohr calls listening “for a deeper voice than your own, which you will know because it will never shame or frighten you, but rather strengthen you, even when it is challenging you. If it is God’s voice, it will take away your illusions and your violence so completely and so naturally that you can barely identify with such previous feelings! I call this God’s replacement therapy. God does not ask and expect you to do anything new until God has first made it desirable and possible for you to do it. Grace cannot easily operate under coercion, duress, shame, or guilt.” For me, this is the voice of Jesus brought to us by the Spirit of God. It takes time, practice, and study of the Gospels to learn to hear this voice. It takes careful discussions with other Christians, a mentor, someone further along the path of following Jesus to learn to hear this voice, and at the same time, it takes the attitude of a beginner or a learner. “Let the little children come to me, and do not stop them; for it is to such as these that the kingdom of God belongs. Truly I tell you, whoever does not receive the kingdom of God as a little child will never enter it” (Luke 18:15-17). I offer you one last thought for your reflection. Jesus faced these same challenges for his ministry. Before he stepped out into the world with a word of Good News, he is brought into the desert by the Spirit. I like to think this is his place to enter into the prayer I described above, seeking the guidance of the Spirit. In this prayer, Jesus faces three temptations and each relates to a misuse of power: economic, religious, and political power. In Jesus prayer, he must face the subtle disguises of ego, control, and the need to be right on his own terms, and he must learn to enter into a freedom from these forms of power, so that Jesus can teach with a true inner authority, free from the disguises that try to trip all of us up. In deep prayer with the Spirit, Jesus dismisses each threat to his freedom, which frees him to speak truth to the oppressive powers of his time, not for his own ego, not for his own purposes or control, but for the Kingdom of God, the will of God, and the reign of God’s grace. In it all, this is what Jesus’ life looks like from top to bottom, inside and out: “Love, joy, peace, patience, kindness, goodness, trustfulness, gentleness, and self-control.” And this is the WHY for Jesus’ interpretive approach to the Word. Jesus’ application of the scriptures is different than the teachers around him. He disagrees regularly with the scribes and Pharisees. He argues with the leaders of the Jewish court (the Sanhedrin). He uses scripture in a way that simply cannot be tolerated by the majority powerbrokers in his own culture and time. We have elevated Jesus above our own humanity. We have clung to his divinity with so much of our faith that we have lost his connection to his community, his culture, and his religious and pedagogical context. When we cling so desperately to Jesus’ divinity to the neglect of his humanity, we miss the radical nature of his teaching, for we cannot see what was obvious to those who first heard him teach. There is a reason that the typical response to Jesus’ teaching goes something like, “He taught them as one having authority and not as one of their scribes.” The authority prescribed to Jesus is power, rule, or control over the texts and traditions that shape the lives of the Jewish people. In other words, he spoke of the Word of God, as if it served him, rather than he served it; as if it was under him, rather than he was under it. Because we cling to Jesus’ divinity, this idea seems blasé. What’s the big deal? When we remember Jesus’ humanity, this approach to scripture is astounding, radical, and life-changing. we enter into these conversations, but I don’t think it is right to say we don’t have authority. There is no clearer example of Jesus exercising that authority than in the Sermon on the Mount. Six times in a row Jesus says, “The Law says (you have heard it said) … but I say” (Matthew 5). over again, Jesus reinterprets and sometimes contradicts the teachings of scripture. scripture with some degree of confidence. That is a whole other letter! The Bible (Part3): Jesus' "Hermaneutic"
When we talk about the interpretation of the Bible, there two Greek words that frame what everyone is doing. The first word, which is much more well-known is, “Exegesis.” The word literally means, “To lead out.” It’s related to the English word, “Seek.” We commonly define it as, “to interpret a text by way of a thorough analysis of its content.” For the Bible and Christians, we say exegesis is seeking to discover the Spirit was saying through its human authors in each text.” The dangerous opposite of this term is called, “Eisegesis,” which means, “To lead in.” Basically, we interpret a text based on our pre-conceived ideas or theology. We make the text say what we already believe. The second word, which is less known, but often more important is, “Hermeneutics.” The word literally means, “Interpreter.” We commonly define it as, “the science of interpretation of a story or text, and the methods used in that science (emphasis mine).” For the Bible and Christians, we say hermeneutics is the way we discover meaning in the Bible for our life, faithfully taking its intents into today’s world. In other words, exegesis is faithfully seeking what the Spirit says in the Word. Hermeneutics is how we go about that seeking and applying it to our lives today. With that introduction, I want to turn next to Jesus’ hermeneutic. I believe this is our essential work in trying to understand how we go about interpreting and applying Scripture for our lives. We’ve already hinted at Jesus’ exegetical practice. You can read my second letter below about reading Bible with the eyes of Christ. Jesus’ hermeneutic is a little more difficult to decipher. While we see him exegete the Hebrew Scriptures, he never says, “This is my hermeneutic,” so we need to look at his patterns and try to draw some conclusions. Here are some patterns that I see throughout the gospels. First, Jesus actually does not quote Scripture that much. In fact, he is criticized for not doing this: “you teach with [inner] authority and not like our own scribes” (Mark 1:22). In order to understand this criticism, we must know that the typical hermeneutic at the time involved two basic structures. Anything a scribe or Pharisee said needed to be supported a reference to Scripture. Second, Jesus talks much more out of his own experience of God and humanity instead of teaching like the scribes and Pharisees, who operated with a style like a form of case law by quoting previous sources. This style is traditional. Each teacher was almost required to lean heavily on the influences of previous Rabbis, building their teaching on the proclamations of those who came before them. We see this practice in most present day dissertations, laying out the full range of scholarship on a topic to build a case for the author’s new assertions. Jesus never really uses this case law form of teaching or approach to his hermeneutic. Third, Jesus often uses what appear to be non-Jewish or non-canonical sources, or at least sources scholars cannot verify. For example, “It is not the healthy who need the doctor, but the sick do” (see Mark 2:17, Matthew 9:12, and Luke 5:31), or the parable of the rich man and Lazarus (see Luke 16:19-31). He moves beyond references to scripture in order to understand the teaching of scripture. In fact, in an instance that might scandalize us, Jesus seems to quote some sources incorrectly (for example, John 10:34). Here he references the Law, but the most likely place of scripture for this reference is Psalm 82:6-7. There is definitely no place in the Law for this quote. Fourth, Jesus never once quotes from nineteen of the books in the Hebrew Scriptures. In fact, his focus is on: Exodus, Deuteronomy, Isaiah, Hosea, and Psalms—and those are overwhelmingly in Matthew’s Gospel, which makes sense, since Matthew is the one gospel written for a Jewish audience. What might it mean that Jesus focusses almost all of his attention on these five books (two from the Law, two from the Prophets, and one Worship or Wisdom book)? Fifth, Jesus appears to ignore most of the Hebrew Scriptures, yet these scriptures clearly formed his whole consciousness. On the surface, this appears to be a paradox, but if we look deeper it makes complete sense. Because Jesus’ character and worldview are shaped and defined by the Word of God, he feels no need to proof text his teaching. And yet, if we look closely at what he doesn’t say or doesn’t use from scripture, we find a clear pattern. He never uses scripture to legitimate violence, imperialism, exclusion, purity, and dietary laws, even though there are plenty of references to support these ideas. Why would Jesus avoid these strands of the biblical vision? I believe Jesus understands the trajectory of scripture, which moves us forward with inclusion, grace and love. Sixth, when Jesus does once quote Leviticus (the one rules based portion of the Law), he quotes the one positive mandate among long lists of negative ones: “You must love your neighbor as yourself” (Leviticus 19:18).Why would Jesus avoid the negative lists and focus on the on positive mandate? This forms the pattern of Jesus’ hermeneutic, his how he goes about seeking and applying his scripture for his day. I believe this pattern sets forth a life giving pattern for how we might seek and apply our scripture for today. In my next letter, I will say more about Jesus’ hermeneutic and how we might emulate it for our study of scripture. My first blog spoke of the struggles we have with scripture, how we use it, how we interpret it, and how we are called to wrestle with it, to expand our capacity for God, and to be transformed into Christ. I hope the writing encouraged you and helped you think more about your heart and mind, as you engage the Spirit in the scriptures. With this blog, I want to move forward and address what Jesus taught us about the Bible in the way he interacted with the Bible and used the Bible in his life and ministry. Jesus practiced what the Rabbis called midrash. It is an approach to scripture that consistently uses questions to expand spiritual meaning, to find more and deeper meaning, and to open the text up. Richard Rohr explains it this way, “More than telling us exactly what to see in the Scriptures, Jesus taught us how to see, what to emphasize, and also what could be de-emphasized or ignored.” If we seek to follow Jesus, to be transformed by the life and ministry of Jesus, it begins with imitating Jesus in this approach. When we discover this spiritual reading of Scripture, the historical events from which it proceeds becomes less vital. I need not fret over the perfect factual accuracy of Scripture’s history, because the writers were not journalists, they are engaging us spiritually to convert us and change us. When we engage in this spiritual reading of Scripture, this midrash, we discover that Scripture can be understood on at least four levels: literal meaning, deep meaning, comparative meaning, and hidden meaning. The literal level of meaning doesn’t get to the root and, in fact, is the least helpful to the soul and the most dangerous for history. Deep meaning offers symbolic or allegorical applications. Comparative study combines different texts to explore an entirely new meaning. Finally, in traditional Jewish exegesis, hidden meaning gets at the Mystery itself. Midrash allows and encourages each listener to grow with a text and not to settle for mere literalism, which, of itself, bears little spiritual fruit. It is just a starting point. We find Jesus practicing this spiritual reading quite often when engaging with Scripture. In the Sermon on the Mount, Jesus says, “You have heard it said, ‘Eye for eye, and tooth for tooth’ (A reference to both Exodus 21:24 and Leviticus 24:20). But I say to you, do not resist an evildoer. But if anyone strikes you on the right cheek, turn the other also” (Matthew 5:38-39). Jesus reads Scripture in a questioning way. He expands it, opens it up, and moves beyond a literal reading of the text to reveal a hidden meaning. And in doing so, Jesus suggests the opposite of what Scripture teaches in its literal meaning. There is no better reflection of what we said last week, “Whatever is received is received according to the manner of the receiver.” Jesus has a vision of empathy, compassion, inclusion, mercy, justice and love, so rather than teaching us what to see in Scripture, he teaches us how to see through his vision. For some, this wrestling with Scripture to open up possibilities and new meaning feels reckless or radical. The criticism is that it’s a soft way to make Scripture and its commands lighter, easier, or less weighty for how we live. But this is not the case at all. In Matthew 5:21-22, Jesus again uses this spiritual reading to wrestle with Scripture. He says, “You have heard that it was said to those of ancient times, ‘You shall not murder’ (Exodus 20:13); and ‘whoever murders shall be liable to judgment.’ But I say to you that if you are angry with a brother or sister, you will be liable to judgment; and if you insult a brother or sister, you will be liable to the council; and if you say, ‘You fool,’ you will be liable to the hell of fire.” In living out his vision of empathy, compassion, inclusion, mercy, justice and love, Jesus expands and opens up the possible meanings of Scripture and does not lessen its weight in any way. Again, Jesus is not so much teaching us what to see, Jesus is teaching us how to see through his vision. The Word of God has always held a special place in my life. When I was younger, my mother worked with me to cultivate my gifts for memorization by grafting the Scripture into my heart and mind. I memorized dozens of Psalms, large sections of the prophets, most of what Jesus teaches in the gospel, the book of Philippians and Colossians and many other writings of Paul. I cannot see the world without looking through the lens of God’s Word. It shapes my relationships, my ministry, my politics, my spending habits, and every part of my life. I cannot say that I have lived it out faithfully at all times and in all places; therefore, it remains chief disciplinarian for how I live, breath, and move. And yet, as much as God’s Word has formed the whole of my consciousness, it remains problematic for me in many ways. In the hands of egocentric, unloving, or power-hungry people, scripture has been used to burn heretics, legitimize the Crusades, slavery, apartheid, homophobia, and the genocide and oppression of native peoples. If the Bible can be used in such wicked ways to bring such horrible disasters, what are we supposed to do with it? This description lays out our humble wrestling with the Word, as we seek to be transformed by the renewing of our mind into the mind of Christ (Romans 12:2, 1 Corinthians 2:16, and Philippians 2:5). What I have discovered is the Risen Lord reveals the very nature of God and that we live in a Christ filled, therefore, love filled universe. In this unveiling of God in Christ, I am transformed, growing up as I move through the text and deepen my experience of God through the Holy Spirit. I implore you; stick with God’s Word and with your inner life with God, and your capacity for God will blossom. People at different levels of maturity will interpret the same text in different ways. There is no one right way to interpret sacred texts. How you see is what you see; the who that you bring to your reading of the Scriptures matters. Who are you when you read the Bible? Defensive, offensive, power-hungry, righteous? Or humble, receptive, and honest? Surely, this is why we need to pray before reading a sacred text! Hebrews 4:12 tells us, “Indeed, the Word of God is living and active, sharper than any two-edged sword, piercing until it divides soul from spirit, joints from marrow; it is able to judge the thoughts and intentions of the heart.” It seems to me that our handling of scripture, our interpretation of it, is that active and living Word. With this in mind, I offer you these final words: wrestle with scripture. Pray every time you engage with Christ in the Word. Ask God to renew your mind into the mind of Christ, to shape how you see what you see, to help you be humble, receptive, and honest in knowing yourself and in seeking God’s goodness, truth, and beauty. Let the Holy Spirit transform you with love, mercy, and grace, so that your heart and mind might expand for more God in your life. As you move through the travails of what it means to be human, recognize these same travails in the scripture, a testimony to the people of God’s experience of God’s self-revelation in Christ and in the Bible. It is the beginning of a new year, and as the calendar turns, I think it’s natural to spend some time looking backward and then spend some time looking forward. When I look backward, I’m encouraged and inspired by who you are and what you have done over the past year. With this in mind, I offer this first paragraph as a thank you letter. I’m grateful for your love and support. Jen and I were overwhelmed once again by your generosity in our Christmas gift and your many kind words in the card. I have saved every one of those cards, and from time to time when I’m feeling down, it does my soul good to take one out and re-read the encouragement and love that you share with me. It means more than you could ever know, thank you. I’m grateful for the support that you offered with my sabbatical. The bulk of that work happened in 2017, but after Easter in 2018, you entered into a time of reflection on discipleship and our bodies. You read my little “booklet” on my experiences and how I grew find hope and meaning in the connections between our spiritual walk and our physical bodies. You might have considered some changes or learned some new ideas or even been challenged to think of things a little differently. You gathered together as a community every Saturday to try new things (Yoga, Praying through a Labyrinth, Art) and you enjoyed some old things once again but together (A Game night, Scavenger Hunt, Cooking a Meal together). You gave your time and energy to this 40 Day Event together, thank you. I am grateful for your spiritual maturity, as we worked our way through the process of approving a new welcoming statement. You attended Bible studies and educational meetings, you talked with each other, and some of you served on a leadership committee for all that work. You agreed, and you disagreed. You listened, and you learned. You came to a place of real inclusion, and in that you never sought to exclude those who disagreed with you. This is not easy work, and holding the tension of that real inclusion is counter-cultural, but reflects the Gospel of Christ, thank you. I am grateful for the new things that you’ve tried over the last year. You worshipped outside for the month of June, a way of moving the gospel out of our building and into the community. You put up a prayer fence, engaging and encouraging the community to share their joys and concerns. You continued the Circle of Friends dinners and expanded that ministry by continuing to partner with different groups. You supported missionaries abroad and in our country. You held an awesome Church picnic and invited everyone from the community to join us … thank you. You did so many little things that always seem to slip through the cracks. You came to church, and invited friends. You taught our children. You attended Bible studies. You lead worship and read scripture. You hosted fellowship. You cleaned up the church. You gave generously. You decorated the church. You welcomed newcomers. You shared your faith and life together. You hosted small groups. You invited me into your homes, stopped by to talk and ask questions. You gathered to pray for the church, for me, for the community … thank you. I could say more, but then this letter would go on forever. Jesus did not so much love people once they changed, but he loved people so that they could change. There is a truth in these words that I need to hear as much as anyone else, but I also think that we need to hear it as a Church. I think it can encourage us, as we move forward, trying to follow Jesus, letting him love us, so that we can change, and following Jesus by loving people, as they are, and thus allow Jesus to bring the change that they may need in their life. I’m not really big on New Year’s resolutions, but I think we might consider something a bit more honest but still hopeful, and that is intentions. I wonder as a church if we can make it our intention to let Jesus love us, even as the gospel seeks to bring a primal change of mind, worldview, or way of processing and perceiving. I wonder as a church if we can make it our intention to focus less on outside or over there, less on accusing, and recognize our own complicity in evil. I wonder as a church if we can make it our intention to pay attention to those who are excluded, deemed unworthy or demonized and maybe even stand with them in solidarity. I wonder as a church if we can learn to see how those we exclude reveal our unquestioned idolatries … This is not an easy group of intentions, but when I turn back to all the things I’m grateful for with you, I think they are possible. Let us begin with #1 and let Jesus love us, and then see where the adventure takes us.